this panel is a pleasure to play with, using a D50. excellent work. This is awesome, Can’t wait to try it out! 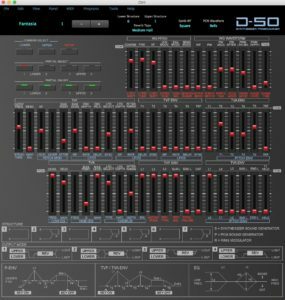 Can It be used with the “Virtual d50” of the Roland Synth xt? thank you so much for the editor. It’s incredibly useful! My goal was to split your controller by each partial and map them into individual racks so that I can work around the limit of 127 midi CCs. I hope you can follow my crude description and maybe have an answer or instruction on how to map all parameters. I also use Ableton and can only see 64 parameters from the CTRLR plugin. i don’t have a clue if its a limit from the CTRLR itself. 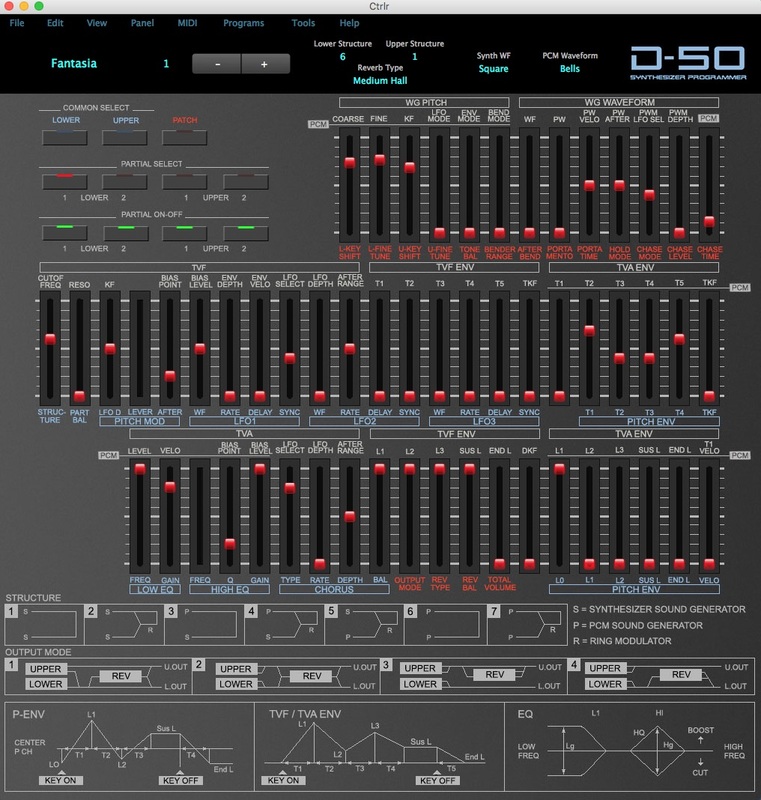 The D50 editor have 321 parameters, if you open modulator list from panel menu, you will see all parameters having a VST index number (0 to 321), you can modify by double click and change value. Maybe someone else can answer this in the forum why Ableton only recognize VST index 0 to 63 only. Hey, great work on this! Switching through the patches on this panel works fine on my D-50 but I can’t seem to get anything else updating, are there any standard gotchas I’m missing? Confirmed that it works flawlessly with the D550! Thank you for this essential panel! I just didn’t get it started. It worked after several trys for one time a few day ago. But now there is only silence. I run it in standalone mode and just the Programms are changing on my Keyboard. But all sliders did’nt send or receive any data. What am I missing? I love this editor, but I’m having one problem. The lower partials work fine, but if I play any note on the keyboard, all upper partial parameters get set to 0 (the slider goes all the way to the bottom). Is this a bug in the panel, or do I have something configured incorrectly? OK, I debugged the problem and sent meastempo an update to the Lua code. Hopefully he/she can post an update to the panel. Looks like I have the same problem as Zain above. I can change programs but nothing else seems to work. “Exclu” is “On”. Any ideas what else it could be? I don’t know if this could be any help, but try set the D50 to channel 1 (midi menu 1 and exclusive ON in midi menu 3), set MIDI port IN & OUT correctly in CTRLR menu to the D50. Do the editor work in CTRLR standalone mode?, check your midi cables. This panel was programmed and tested with CTRLR version 5.3.83, i had issues with later releases on mac OSX. I tested it with 3 different midi interfaces and had no issues like you describe, also only tested with Ableton Live. My D50 was s sold last year and i planning to get an D550 sometime. Great work on this I greatly appreciated it. I have a question. I tried in in standalone mode works great so far, but in reaper when I exported a dll there are 2 things I noticed. One I can not use the current midi port I think I am supposed to use pass through and also the enable disable partials buttons will not work. a song I am working on in reaper. I’ve only tested and used this editor in Ableton Live on mac OSX CTRLR version 5.3.83 when i had the D50 (see replyed answer above), i had no issues as you describe with partials buttons not working in plugin mode, if it’s working in standalone and not from an exported instance/dll, maybe you could install CTRLR 5.3.83 and try export a new dll from it. If i remember correctly i only tested it with midi channel 1 in the D50. In Ableton i only see midi parameter 1 – 64, this editor have 321 parameters total. There was an answer from user pascalc about this issue earlier, (it didn’t worked for me since i’m using mac). if you open modulator list form CTRLR Panel menu you see all parameters have their unique vstindex number 1 to 321, you can change parameters vstindex number if you want to customise your own midi cc. Just tried it on a D550 that I bought to replace my D50. Worked out of the box. Great job on this. UI is a bit complex to me yet however. Would be really cool, to dim/highlight, whichever elements you are editing. There is a little bug in controlling the mute status of the upper partials. Check it out, it doesn’t work right now. The “-82” value is the fix. I tried using this with the new Roland D-05 with no success. Is it usable with the D-05 and if so could someone give me some advice on getting it to work? I’ve got this working with my D-05 but there seems to be a problem with showing the right Patchnames. When going up the patchname is lagging behind … always the previous one is shown. Anyone any idea what the problem can be ?